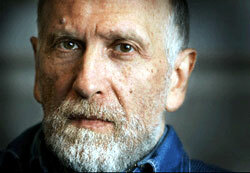 It is well known that Bobby Fischer considered the Karpov – Kasparov world championship matches to have been prearranged. Not just the results, but the games themselves, move for move. Fischer stated his views in an interview with an Icelandic radio station in 2002, and Yasser Seirawan provides an account of his experiences with Fischer in his outstanding book No Regrets. After Fischer moved to Iceland in 2005, GM Helgi Olafsson, who, like Seirawan, did not share Fischer’s views, resolved to show him that his theories didn’t hold water. However, he soon discovered that changing Fischer’s mind was a difficult task. In late May 2005, Fischer showed Olafsson a position that he considered irrefutable proof that the games were prearranged. The position was from the ninth game of the 1984 Karpov – Kasparov match in Moscow. Fischer’s theory was that whoever composed the Karpov – Kasparov game could only have done so by using his ideas of how to win this type of position. It could not be based on an older game because this was the first demonstration of how to win such an endgame. Additionally, similar positions occurred so rarely that it was impossible it could arise by chance in such an important event as a championship match. Olafsson, however, had his doubts about Fischer’s win being the first in such a position. In the “White” column of the “Material restrictions” panel, I set the “From” and “To” values for white pawns to six, meaning that we are looking for positions where White has exactly six pawns. Similarly, White must have exactly one knight. In the “Black” column, I require six black pawns and one black bishop. In “Total number of pieces” I set both values to sixteen, meaning that there must be exactly sixteen pieces on the board (including the kings). All other values in this dialog box are set to their default settings. Since “Ignore colors” is selected the search will also find positions where Black has the knight and White has the bishop. The result is a list of all games where the material is equivalent to the positions shown above. The search produced a list of a little more than 20,000 games, which I then used for all subsequent searches. This made them lightning fast. Next I wanted to produce a much smaller list of games that contained positions similar to the ones which Fischer had shown to Olafsson. As I wasn’t expecting to find many games, I wanted to ensure that I would find all those that could be relevant, so I decided to find the following types of positions. On the top left we see the position from Saidy – Fischer. White has the bishop and the center pawns are on d4 and d5. The position on the top right is from Karpov – Kasparov, where White had the knight and Black had the bishop. The two positions at the bottom are similar, except that the pawn structure is mirrored vertically. The center pawns are now on e4 and e5, there are three pawns of each color on the queenside and two on the kingside. 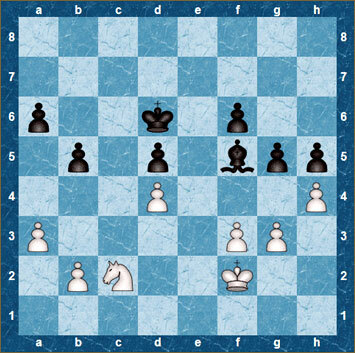 I started by limiting the search to positions where none of the pawns had crossed the midline by more than one square. 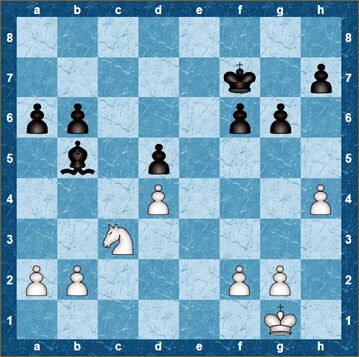 If I didn’t find what I was looking for, I could always relax this requirement and search again; note that in the diagrams above none of the pawns have crossed the midline. Use a combination of advanced search (Search -> Advanced) and the material search shown above. I preferred CQL for two reasons. First, because it is simply the most powerful search tool available, and second, because it allows me to store the searches (CQL queries) as text files. These are then easy to modify when you want to alter the search criteria. Note that you can also save other types of searches in Chess Assistant, but CQL queries are easier to manipulate once you master the basics. The CQL query below is a modified version of the one I originally used. It consists of two main sections. In the first, we see a repeated use of the :piececount keyword. This is used to specify the number of different types of pieces on the board. The second section of the query describes the location of the pieces by using so-called piece designators. The :piececount keyword is best understood by looking at a couple of examples. This matches a position where there are no rooks or queens on the board and also no white knight or black bishop. In other words, the only allowed pieces are pawns, white bishops and black knights. 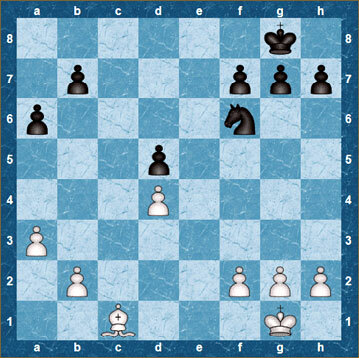 This piece designator matches a position where there is a white bishop (B) on a dark square. The squares listed in the brackets are all the dark squares on the board. I described the basic structure of CQL queries in the December 2007 column, including the “match” and “position” keywords. The :flipcolor and :flipvertical keywords, which you can see near the end of the query, are very powerful. If you look at the four diagrams above, I would only find positions similar to the one on the top left without these keywords. The effect of :flipcolor is to transform the query so that it also finds the positions shown on the right hand side and :flipvertical allows me to find the types of positions shown at the bottom. So, with the help of these two keywords, a single CQL query allows me to find the four types of positions that are illustrated above. The next step was to run the CQL query. Selecting “Search” on the menu bar and then “CQL search” displays a dialog box where the query can be typed in (or pasted) as shown here. To start the search click “OK”. After about five seconds the search produced a list of 242 games: 132 draws and 110 with decisive results. Next I looked at the 14 games that were played before Saidy – Fischer. Out of these, four ended in a draw, others were trivial wins and some were badly played. So perhaps Fischer was correct after all. Maybe he had been the first to show how to win such positions, since the winning method was not trivial. The oldest game was Herzog – Eliskases from 1934, but it was a trivial win. The second oldest game was Levenfish – Kotov, (Leningrad 1939). This is the position in the game located by the CQL query. Levenfish won the game using a method reminiscent of the way Fischer won against Saidy. Another interesting game was Fairhurst – Keres (Hastings 1955). Realizing that my task was complete, I called Olafsson and sent him all the games I had found. I wondered how Fischer would react when he saw the games. Yet I didn’t have to wait long. Olafsson called me after meeting with Fischer, who had recognized the Fairhurst – Keres game when he saw it. After going through the games Olafsson was pleasantly surprised by Fischer’s reaction: “Unbelievable! Wow, great research.” and then he laughed. He never mentioned this position again to Olafsson, clearly feeling that his theory about the game being prearranged had been refuted.